If you’re a kayaker and seeking to learn kayaking on Chile’s world class whitewater, you’ve found the right place. We wear many hats at Pucon Kayak Hostel, but at the end of the day, we are all kayakers. Exploring rivers in our little high performance boat are what brought us here and kayaking is what keeps us here. Every Service a Kayaker Could Possibly Need. Kayakers pass a herd of goats on the Teacups shuttle in Chile’s Central (wine) Valley. 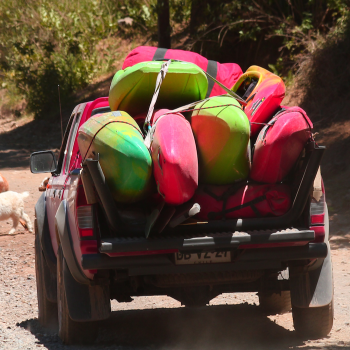 Multiday Chile Kayak Trips (II, III, and IV+): For those with limited vacation time, we highly recommend joining one of our all-inclusive trips. Our trips were carefully designed around the three regions of Chile on every kayaker’s bucket list: Central Valley Region and Claro, Pucon Region, and Futaleufu. We’ve optimized weather, water levels, and logistics so you can log river miles in some of the most coveted destinations anywhere in the world. Choose from world’s best waterfalls, creeks and river selections, and the majestic big volume Futa water. Vacation Certification Courses +PLUS Kayaking: Knowing the courses we took to become paid professionals we now offer those courses to our guests. Since, we are kayakers we thought it would be a crying shame to offer a course in Chile without daily kayaking. Hence, now you can goto class for half a day and then after lunch go charge the stouts. IT’S AWESOME!. Courses include: ACA Kayak Instructor Level 4, ACA Swiftwater Rescue Tech 4, Advanced Wilderness First Aid, and Video Productions. Do-it-yourself: Got logistics like transportation, safety and river beta dialed and on a budget. Come rent a kayak, camp or stay in a dorm room for less. Still want a package then try our Kayaker 5-Pack for kayakers looking to save as much as possible. Discounted Trip Extensions: Trip guests often want to kayak and explore more. Trip guests qualify for a trip extension discount. Includes – lunch, dinner, kayak, 1/2 day river trip, transportation, and coach. $140 +lodging. Looking to put together your own trip to Chile? You can reserve PKH services on an as-needed basis and still save money if you book in advance. Pucon Kayak Hostel provides kayak rentals, gear rentals, vehicle rentals, and has a daily shuttle service. In addition to lodging, guests enjoy meals cooked twice a day in our quincho, treehouse showers, clean changing rooms and bathroom facilities. You’ll also have access to a shared workspace, yoga studio, and movie-watching spot in our eco-dome. And of course you’ll enjoy convenient river access at our Rio Trancura property.